Viber Out service is available worldwide! Viber Out service is available worldwide, with full support for iOS, Android, BlackBerry, Windows, Bada, Mac, Linux, Symbian and Nokia S40. Viber is a popular cross-platform VoIP calling and messaging application with more than 200 million users in 193 countries. 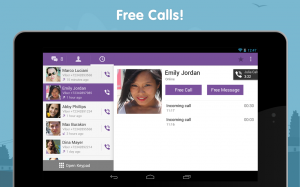 Viber allows any pople with the app installed to communicate via voice or text for free. With this new service, the company adds the ability to make low cost calls to any phone number. With Viber, you can share photos, voice messages, videos, locations, stickers and emoticons. The app also includes the possibility to create groups up to 100 participants. The new service uses credit that you can obtain either through in-app purchases or vi credit card if you are a desktop user. All the credit can be then used on Android, iOS or desktop client. The most attractive feature Viber is offereing is the rate plans. 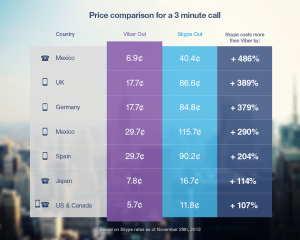 Viber Out has a significantly low price-per-call and it doesn’t have connection fees. As a result, the prices are substantially lower than Skype for users located in many countries. The company wants to provide HD audio at a very competitive price. These low prices are going to cause some noise on other providers of similar Internet calling services, and it’s possible that in the next days we see some kind of response. An important difference with other similar services from other companies, is that Viber Out displays real phone numbers to the recipient, so he can know who is calling. And if you are using Viber Out on Desktop, it has you phone’s address book. Android and iOS users can download Viber for free on the Play Store and iTunes respectively.